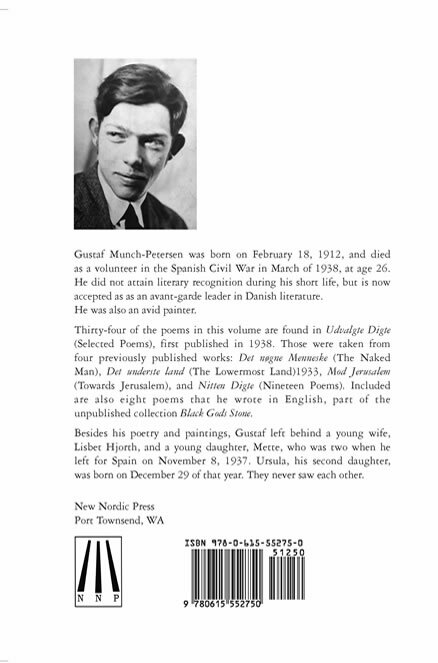 This is a bilingual edition of the selected poems of Gustaf Munch-Petersen, translated from the Danish by Brian Young. Gustaf Munch-Petersen joined the International Brigade in the fight against fascism during the Spanish Civil War. He died in battle in 1938. He was just 26 years old. He published four major collections of poetry during his short life. 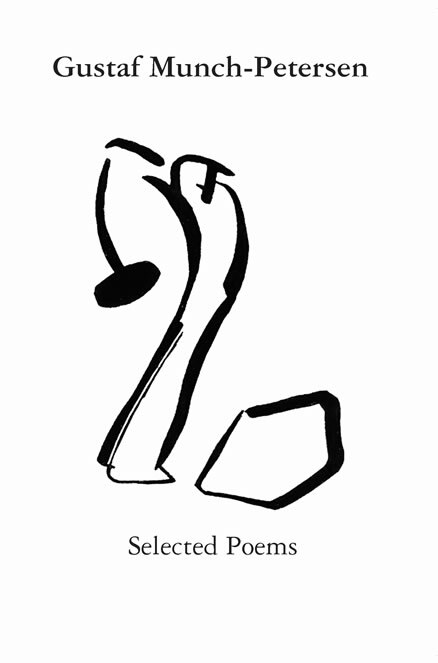 These poems are taken from those collections. The book also contains a tribute to her father by Ursula Munch-Petersen, his youngest daughter, not yet born when Gustaf left Denmark to fight in Spain. Gustaf Munch-Petersen is my father. He was only 26 years old when he died, and it seems strange that he is still being published and read, not just in Danish schools, but now also in America. Besides his poetry, he left behind two daughters– my sister who was two at the time, and me, not yet born. My sister Mette got married in Norway and had five children, and eight grandchildren. And I have two sons and three grandchildren. It says in the Bible that the sins of the father are passed down through seven generations. All of Gustaf’s grandchildren have been marked by their grandfather’s absence, while at the same time he is proclaimed a hero. My sister felt betrayed, and has spoken very little about her Danish childhood. And now her children are asking me about it. I have often thought, when I felt sad, that there was something waiting in Heaven–some kind of inheritance. When, as an adult, I read for the first time the book Primitive Religion by the Danish religious historian and linguist Vilhelm Grønbech, I experienced clearly my relationship to my father. My grandma had told me that Gustaf was tired of school, and that he would only take lessons from Vilhelm Grønbech, who wrote extensively about so-called “Primitive Religions.” My father’s insistence on taking lessons from Vilhelm Grønbech, and my joy and surprise when reading about the world’s religions as an artistic aspect of my life, helped me to feel a connection to him. Every time a soldier is killed in Afghanistan I think about the far-reaching consequences for the families. But that my father’s poetry is still being printed and read, and because he felt it was an extension of the concept of art, and that he took his feelings and thoughts so seriously that he went to Spain when war was on the rise— that gives his fate meaning. In 1937 you could still believe in the promise of the international participation for the defense of the Spanish people. Last year I was in Spain where now– and first now– one can talk openly about the civil war. A museum there had a collection of photos of all of the international brigades. There were volunteers from India and China, and it surprised me that people from so many places in the world came to fight for freedom. I don’t know what young soldiers today are thinking when they say that they are going to war to “Make a difference”, but death in modern warfare must be even sadder and more meaningless today than it was then. Copyright New Nordic Press, all rights reserved.